OK, I've written about this a few times. I'll try to be a little more in depth with this post. First, and foremost, this is true ROADFOOD. You do not order this pitza and wait for it to bake and then sit down and eat it. You get it cold (room temperature) at the cash register of a gas station or convenience store, take it out to your car, start driving again, and eat it while you drive. It is not a hot, sloppy, cheesy melting pizza; it is cold, moist, soft pitza. Crossing Pennsyvania on I-80 or I-81, or the NE extension of the PA Turnpike, I-476. Get off near Hazleton at any exit with a mini mart, and you will find this stuff (either Senapes or Longo's) selling as individual squares, cold, wrapped with plastic wrap. That would be, on I-80, either the White Haven (Rt 437), Mountain Top (Rt 309), or Conyngham (Rt 93) exits; on I-81 any of the 3 Hazleton exits; or on I-476, the White Haven exit (which is also the interchange with I-80). Sometimes the upper layer of dough overlaps the sauce, on this one there's just a nice flavorful rope of sauce running down the middle. The crust on a pitza boat is soft all the way. So, you eat these cold. It's roadfood on the run. For some reason, they don't get stale; rather they ripen and change, actually getting better (to a point) as the day goes on. These were purchased at 8AM this morning; they sat out all day, and I took the pictures (and then ate the slices) at 9PM. If you refrigerate them, they dry out in about half a day. But as they sit during the day, the oils come out of the cheese, the sauce cures a bit, the crust "stales up" a little, and the whole thing gets this wonderful aged flavor that I've never tasted anywhere else. To test and make sure that it hasn't been out too long, pick up a slice and bend it a little (parallel to the edge, the edge won't bend). 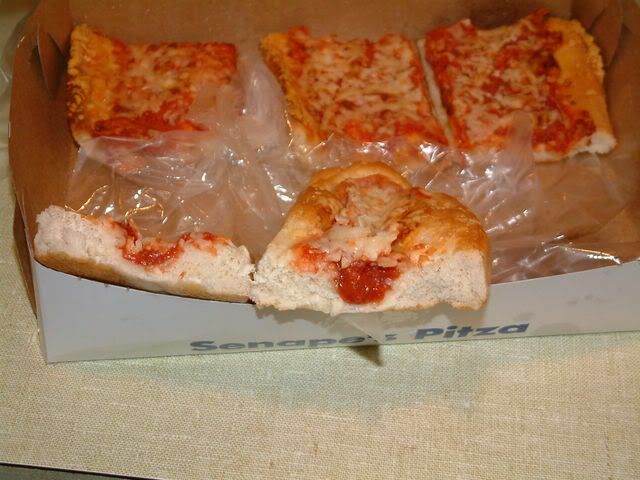 If the crust is hard under the sauce, then the slice is past its prime. If it's still soft, then happy eatin'! As I sit here typing, I can still smell the ripe cheese and sauce on my fingers. There's nothing like a slice of Senapes! Now thats a different twist on pizza.. Or should I say pitza. Sounds intresting! LOOKS roadfoodable to me! I'd give it a shot! I've been to Sanape's and Jimmy's in Hazelton (been traveling I-81 for over 30 yrs a couple times a year), but never had the Pitza. I will definitely get some this spring when I stop for pastries and hotdogs in Hazelton. If it means anything to you, my mouth was watering halfway through your description. I've never been over that way, but I guarantee I'll give this a try should the day ever come that I'm nearby. I just found out, the cheese is home-grated Romano. I'm willing to bet that I ate Senape's Pitza futher from Hazleton then any other person. My parents somehow arranged to have Senapes Pitza mailed to me on a firebase in VietNam in 1970. when I opened the package (3 boxes) most of the middle box were still slightly frozen. I invited the rest of the team to my bunker for Pitz and Aussie beer. I stop at the bakery for a box when I'm anywhere near Hazleton (two or three times a year). You can be tempted to save a buck buying "yesterday's pitza", and either way you can't go wrong. It's very addictive stuff! Cheap and immediately gratifying!! And another reason why pizza freaks need to make at least one trip to Northeast PA in their lifetime. (See Old Forge Pizza posts on this site for more). Oh jeez, the Pines. I work across the street. is hazelton near wilkesbarre? there was a place called the victory pig had same style pizza but served hot. Same area. Victory Pig is completely different and tastes different. This is baked, fresh romano sharp tasting, and made with a pizza shell. VP is sweet, mozzarella and onions tasting, and is fried in a half inch of oil rather than baked. If anything they are polar opposites, taste wise. I'll go as far as to say I don't like VP and wouldn't even consider recommending it... but others simply adore it. HWMCMM, that's a great story! Mosca, how is the Knotty Pine? It's been on my "hit list" for quite a while. The outside decor is peak Roadfood. Victory Pig is commonly called "Polish Pizza" (not derogatory, there is a large Eastern European ancestry here). They are only open Wednesday, Friday and Saturday nights. The quality varies from amazing to just OK, you never know. It's expensive for NEPA pizza (I paid around $15 for a dozen "cuts" last year.) If you go, make sure you add a bit of salt to it...that makes a huge difference! The Pig has been around forever---and they have Curb Service! My mom remembers going as a little girl and she still orders Chocolate Milk with this pizza. There's a pharmacy across the street, buy Tums. Still, if you're curious, I'd recommend it. (Many small aircraft pilots fly into the Wyoming Valley Airport just down the road to take some home). However, the best "Pig" style pizza IMHO is Pizza Perfect Carverton Road in Trucksville (off Rt. 309). It's ALWAYS reliable, not as greasy, open nearly every night). You can order without onions, but to me, that's what makes this pizza. If you want to totally clog up the arteries, split a dozen of wings while you're at it. They are pretty darn good. Expect to wait on weekends, especially Lenten Fridays. The Pine is curiously average. You wouldn't think so, by looking at it both inside and outside. Best bet is the homemade ham or turkey croquettes, when they have them, those are great. Otherwise, you get frozen burger patties, canned gravy, stuff like that. The pies and sundaes are really good, though. where on the jukebox. Also another place to dance was at the YWMC on Broad St on Wednesday night. HHS class of 57. I work with Richie Molinaro; he filled me in on a lot of that stuff. For those not from here, Richie was in a garage band that came <this close> to making it big in the mid '60s, Ognir and the Night People. They had a pretty big regional hit, "I Found A New Love". Good beat, you can dance to it, I give it an 84... just barely not quite good enough to break national. Good show too! Obscure 60's stuff and a wide variety. I knew about one-third of the songs. Mosca, is that Richie singing?? I know his speaking voice from the Fairway Chevrolet commercials, but can't tell if he's on lead---sounds like he could be! 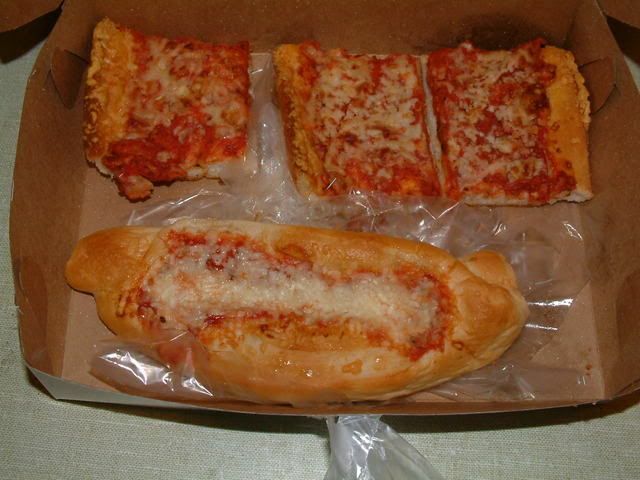 every time I am coming thru Pa,anyone ever eat the hot pitz at Senaeps Bar,the toppings are amazing,if only they could figure out how to ship the stuff mmmmmm,has anyone ever shipped pitza from senaeps?Also some of the best breads from the bakery. Sneape's is such a great Pitza that I can't stand on seeing it buried on the 2nd page. I can't wait till my 50th class reunion so I can once again enjoy it. SENAPE'S PITZ IS THE BEST! 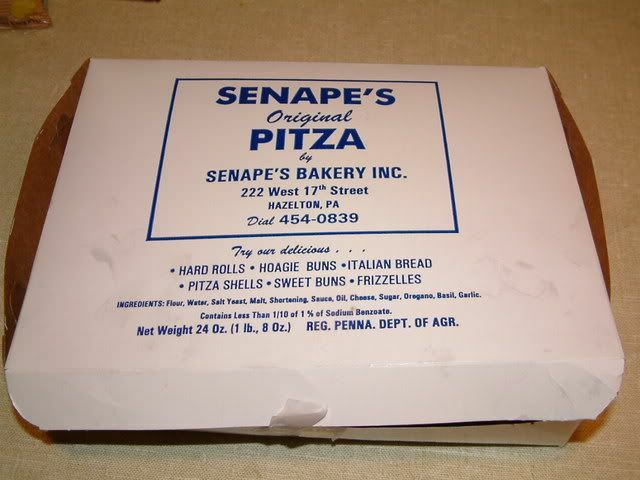 As a child traveling from Mansfield, PA to Philadelphia for holidays, it was a family tradition to go through Hazelton and pick up multiple boxes of "Senape's" for our "city" relatives! Anybody willing to ship me a couple boxes of Pitza? I had family members do this in the past but they are all gone now. I will pay you 20 bucks for your time. Com'om help a Hazleton born kid out??? I was reading this post the other day and it made me crave this kind of pizza. I remembered seeing something like this for sale in the dairy department of my local Giant market. Sure enough they had this kind of pizza for sale! However it was from Longo's Bakery in Hazelton. Looked and tasted exactly like Senape's. It came in a box that contained 12 already cooked and cold pieces. My grandson and I ate all 12 pieces half cold and half hot. Not a bad deal for under $5.00. Woke up that night with heartburn but had rolaids handy. Yum yum!! and the cold stuff you buy in the convenience store or supermarket is much much better than the bar pizza!! Growing up me and my family went to Hazleton to stay with my Grandmother and visit with family a few times a year. Our first stop as soon as we got off the exit would be to visit Senape's Bakery. As soon as we got back into the car the box would be opened immediately and we all would be enjoying this delicious pitza. Next month I am taking my husband and daughters on vacation to Hazleton,PA. and our first stop off the exit will be Senape's Bakery. I have not been there in years and cannot get there fast enough. This pitza is truly one of my favorite things in life.